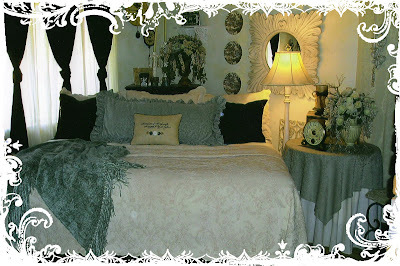 My metamorphosis for you today is my master bedroom. The photo above is from 2000. 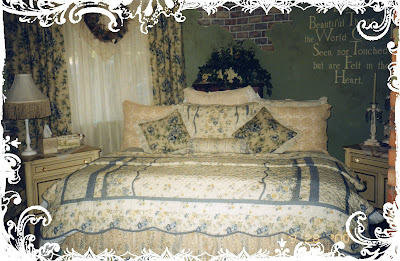 I had just recently discovered my love of cottage style, and everything in the house was frilly and girly. My DH is so wonderful, he just goes with the flow... However as time went on I realized my tastes were changing and I needed something a little less feminine. This is the final result (to date) The room feels more balanced for both of us. Hmmmm... I wonder what the room will look like in a couple more years. The ideas are already churning!!! my husband used to joke that he didn't notice changes...as everything always changed so often...he also remarked that he sometimes was afraid to go away to work...for fear of not seeing things the same way when he got home! Your bedroom looks very pretty! You know, I loved every one of your pictures! Quite a change -- love the three pictures of your room as you changed it. What a pretty blog you have! So glad I found you. I plan to visit often! You have made some amazing changes! I think it is so cool that you thought to take pictures of your room so many years ago. There are so many "before" pictures that I never thought about taking before I started blogging. I hope you enjoy the new look! The magic of paint. Well you did some other color changes too. I'm similar, I keep changing things too. Nothing wrong with that, right? What a lovely transformation! Well done~! Aren't you enjoying the lovely weather we are having? Great job! I know...I like my bed to be more feminine too and thankfully my husband doesn't really care...but I try to remember not to make it too frilly. I like your before and after photos! Great job! It looks lovely and cozy. Good job. Love you room!!! It looks so pretty!!! Love the update! Isn't it great to have a newly redesigned master bedroom? Okay, Karen... I love your room and all the changes you've made, but I have to say, the pooches on your sidebar had my attention real quick. I love animals and animal people. Thanks for visiting my blog, so glad you did so I could find you back. Happy week to you and all your four legged friends! It's Time for the Mad Hatter Tea Party!! !